A couple of months ago I picked up “Creating a World Without Poverty” by Muhammad Yunus. 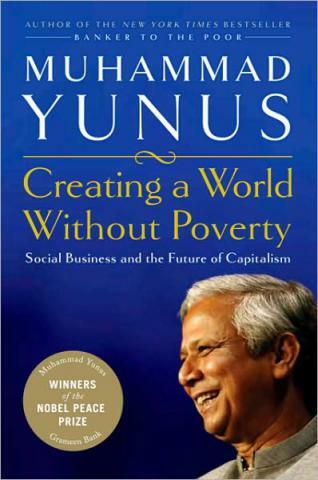 I knew who Muhammad Yunus was, but I’d never read a book by him. However it was the title that grabbed my attention and the overview talking about his idea for Social Businesses. And yes – it took me this long to read it with everything else going on! After working in the NGO sector for the past year, using my skills in Portal & Content Management to help large global NGOs collaborate and share information effectively, I have to admit its had a big impact on how I think about business. Its no secret that I always wanted to start my own hi-tech enterprise and while that hasn’t changed, my motivations have. As Kofi Annan once said: “It is the absence of broad based business activity, not its presence that condemns much of humanity to suffering.” Working in the NGO environment, and seeing the poverty in Thailand, and in a few weeks time, India, has opened my eyes to a whole new world, and why it is imperative that the world generates more wealth by creating new businesses and innovation. I still think my first start-up will be a hi-tech enterprise to make money, but I think that my long term motivations have changed dramatically. I see myself learning the skills to successfully start businesses and accumulating the wealth needed so I can have a positive impact on the world, by creating social businesses in the future. One of my role models, Bill Gates, has shown the way by changing the world with technology and then giving almost all his wealth away to help make the world a better place. Even Google.org is an inspiration on how newly successful companies can have a positive impact on the world. While I’ve always thought about “Social Entrepreneurship” as a business that does good but making money for its investors, Yunus takes it further saying that the business should only return the initial investment back to the investors, keeping all money in the business to improve and expand its services, thus creating a truly social business not measured by return on investment, but impact on social goals it sets out to address. I really like this idea, and I can see how the whole idea could turn into what he describes with social stock markets, social auditing firms and a whole social business news industry around it. I totally agree that capitalism isn’t perfect. I am a big believer in free market capitalism, but because not all the world is given a fair chance to compete either by lack of education or access to finance, we are literally leaving over half the world behind. When I was younger I read all the “Rich Dad Poor Dad” books, and although it was about financial freedom for the average person in the west, it did make a point that most people in the west, not just developing countries, do not understand personal finance. Hence why consumer debt is such a problem in the west, we have access to finance, but no education on whats smart debt and whats bad debt. Hence lack of education is a big problem. In the developing word its worse with poor literacy and maths to even get started in the first place. On top of that, we live in a society that markets “consumerism” to everyone, we’re under pressure to keep up with the Joneses and buy more crap than we’ll ever need! People left to the forces of traditional capitalism will not make the world a better place, there will be more wastage of valuable resources and global warming, and a bigger gap between the rich and poor. Hence why Yunus’s idea for social businesses might work! The more pro-active among us can start a business that does good in the world, fighting these problems, while the rest of us can choose to support these businesses and even work for these businesses without a dramatic change to our lifestyles. The fact is, as my friend Thiago who works for a market research company reminded me the other day, people are all about supporting good causes, as long as it doesn’t make a dramatic change of habits in their life. Its human nature to resist change, and its probably the biggest challenge to changing the world there is – people just wanting to continue the way they have. It doesn’t mean they don’t care, they just get lazy, even I can be accused of that, everyone can. While giving up all our luxuries is good for the environment, how many people actually would? What if all people have to do is buy from a socially responsible business, the business takes responsibility for the problem without people having to make dramatic changes to their lifestyle, something people who try to force that change on people will inevitably fail on. I think anyone who wants to be an entrepreneur should look beyond just making money, businesses are about building wealth not just for the owners but for the people who work for them and the society they exist in. Even better, with corporate responsibility becoming such an important thing for businesses to worry about, think about what you can do on the side to make your business more socially responsible. For example, as a software start-up, I would look not just for business sense, but also building wealth in developing countries, of outsourcing all the development to a country that needs the jobs. Not only do I save a lot of money, I create wealth in a country that needs it! Including the rest of the world now with the way communications technology is, will be a very important part of ensuring the bottom half do not get left behind. I’m not advocating everyone starts a social business, that is a personal choice, and I believe a choice many, like myself, will make once we’ve made it in the traditional business world, but its definitely something we should all look at. NGOs, while they address core problems, rely on donations that can dry up during a recession, they are not self sustainable. Also NGOs would not exist if poverty didn’t exist. If every country could solve its own problems and the people were wealthy enough, why would we need huge charities? Hence why social businesses may be the solution to poverty we have been looking for! All along I have been dream to see how best I can go into NGO with others to help fight the poverty in my country and Africa s a whole. therefore I wish coming from Ghana will help and seeing how best you help me achive my goals in life. thanks.